You definitely don't want to fall on these. Our award ticket from Brunei to Sri Lanka allowed us to make a free stopover in Singapore along the way. We have both visited Singapore in the past so we didn’t have any particular sightseeing in mind, however, we were eager to dig into Singapore’s diverse food scene. Much like Malaysia, Singapore’s food world is a mix of Chinese, Indian, and Malay cooking styles and for being a relatively expensive travel destination, the food is comparatively cheap. Although most of the complex is finished, public transportation infrastructure is still a work in progress as we discovered. Getting there was a sweaty schlep through a construction site in Singapore’s hot afternoon sun. For an orderly country like Singapore, this is way off the norm! Wandering around Marina Bay Sands was interesting enough but neither of us were willing to cough up the exorbitant SG$20 (US$17) admission cost to visit the SkyPark. The following day we paid the Asian Civilizations Museum a visit. There was an absolutely massive line stretching out the door that we later found out was due to a visiting exhibit of terracotta warriors from China and because admission was free for the day. The wait was something like 90 minutes for the special exhibit but we found out way into their permanent collection and soaked up the aircon for a few hours. It is a fascinating museum and I particularly liked the video consoles that showed how some of the arts and crafts were made. As always, Singapore treated our bellies quite well. We made plenty of stops for snacks and meals at the food courts and hawker centers that fill just about every nook and cranny of the city center. On our last day we made the pilgrimage to the Maxwell Road Food Centre and I got a plate of chicken and rice from one of the famous stalls. I also ordered up some black carrot cake which is a strange wok-cooked savory dish that is a local favorite. By mid afternoon on the third day we were growing tired of the hot weather and decided to head to the airport early. For those of you who haven’t visiting Singapore’s Changi airport, it is a sight to be seen. The airport has won piles of awards for being one of the world’s best. The usual passenger facilities like check-in areas, security and immigration are all well-designed and adequately staffed but what really sets it apart is what lies behind immigration. Loads of shopping outlets, free movie theaters, hundreds of free internet terminals, koi ponds, butterfly gardens, etc. Literally enough to keep one entertained for days on end. We crashed out in some free massage chairs for a while next to a koi pond before making our way to Singapore Airline’s Silver Kris Lounge. We started at the lounge in Terminal 2 but it was very crowded due to some renovations that are taking place. Terminal 3 was much quieter and we made good use of the shower facilities and their speedy internet connection. I also made good use of their sushi and open bar! The flight to Colombo was a short 3-hour hop on one of Singapore Airline’s new A330-300 aircraft. Amy had special ordered a vegetarian meal and I availed myself to Singapore Air’s “Book The Cook” service. Good thing I did “Book the Cook” because the menu was strikingly similar to what we had on the flight from Brunei. We didn’t know it at the time but the flight was to be our last taste of luxury (or even somewhat comfortable) transportation for the next few weeks! Once we finished our diving and snorkeling at Sibuan, we headed back to Semporna and bought tickets for the overnight bus to Kota Kinabalu. Completing three dives that same day left me exhausted and I was certain that I would sleep like a baby regardless of the conditions on the overnight bus ride. Naturally, I was proven wrong. Yay, we get to travel in First Class tonight! The bus left at around 7:30PM and by 9PM the air conditioning had stopped functioning. Air con buses are great but air con buses with a broken AC unit are ten times worse than a bus without AC because the windows can’t be opened! We spent the next few hours tossing and turning along with the other 47 people on the bus. Around midnight we came screeching to a halt at some nondescript roadside eatery out in the middle of Sabah’s palm plantations. Half the passengers and the drivers jumped out to take a break. Since neither of us was managing any sleep in the sauna-on-wheels, we stretched our legs. What happened next was quite unexpected. Just as we were about to leave, the ticket guy from our bus came over and said we should move to the other bus. Nobody else was moving but he said we could go “same seats, same seats” he proclaimed. I double, no, triple-checked to make sure the bus was also headed to KK. Indeed it was and he was just moving us because there happened to be open seats on their other bus (from Lahad Datu, another east coast city, I presume) and the AC was working. I was mighty impressed by this gesture! We arrived in KK at some horrid hour…3:30AM or thereabouts. The second bus was much more comfortable from a temperature standpoint but the legroom was painfully minimal. Making matters worse was the fact that they guy behind me wouldn’t let me recline my seat at all. No sleep for me that night but at least we were out of Semporna! Our hotel in KK was completely locked down so we had our choice between a 24-hour KFC and a 24-hour McDonalds. We mooched McD’s wifi and enjoyed a couple of beverages for the next three hours. Brunei, one of SE Asia’s more obscure countries, was our next destination on the trip. Brunei has two small slivers of land on the north coast of Borneo and is home to about 400,000 people. Huge amounts of oil have been discovered in Brunei and this has developed the country and made it one of the richest in the region. Apparently, it is possible to get to Brunei overland from Sabah but it is a huge pain. The easier route, and the one we selected, was to take a boat from KK to Pulau Labuan and then switch to a second boat bound for Brunei. We left KK a little late in the day which unfortunately forced us to overnight in Labuan. We found some decent Indian food there but there was little else of note. The next day we made the quick one-hour crossing to Brunei’s port of Muara and caught a bus from there to the country’s capital – Bandar Seri Begawan. Our immediate impression of Bandar Seri Begawan (BSB, for short) was that it is strikingly similar to Singapore. Not in the sense of there being huge glamorous high-rises and crazy shopping malls – there isn’t anything of the sort, but rather, in the sense that the place was impeccably clean and well organized. We just barely beat a tropical rainstorm to the hotel. After settling into our room we walked to the city center and hired a boatman for a quick spin through Kampong Ayer, the nearby stilt village which many call the “Venice of the East.” Apparently, Kampong Ayer is one of the largest stilt villages in the world and the nickname makes sense to me. It is a bewildering labyrinth of canals and wooden houses and shops all strung together by wooden walkways. What makes it particularly interesting is how the government has officially embraced its existence. Our boatman kept pointing out schools, police stations, and even fire departments that were built into the village. Additionally, many of the houses have drinking water and city sewage service. Very cool! From the boat, we also got a brief glimpse of the Sultan’s enormous palace which has 1,788 rooms! It’s too bad we weren’t visiting Brunei a little later in the month because at the end of Ramadan, the palace opens for everyone to visit and feast. One of the locals we met later in our stay told us that he goes with his family each and every year and that it is a party not to be forgotten. If you are on Borneo for Ramadan, make it a point to be there – that was the message. The main attractions in BSB include the strikingly beautiful Sultan Omar Ali Saifuddin Mosque and the Royal Regalia Museum. The pictures of the mosque speak for themselves, it is an incredible structure and it is unfortunate that we weren’t able to visit the interior (closed to visitors during Ramadan). The Royal Regalia museum was also quite interesting. Photos weren’t allowed inside but you can imagine what is inside: all sorts of fancy royal clothing, huge parade chariots pulled by a 30 men, and of course the many gifts the Sultan has received from other governments. On our second day in BSB we rode on a speedboat to Brunei’s Temburong district which is isolated from the rest of the country by a small piece of Malaysia (Sarawak). The Lonely Planet highly recommended the ride even if we didn’t have a specific reason to go to Temburong and they were right. The boat held about 20 people but had two 150-hp outboards strapped to the back. Jetting through the narrow channels through the mangroves was lots of fun! Once in Temburong we wandered a bit and then grabbed some cold drinks at a restaurant before heading back to BSB. On the ride back, and I’m sorry I wasn’t fast enough to get a photo, we saw a huge crocodile sunbathing along the bank. Now as a Floridian I feel that I am relatively well-qualified to make statements about the size of water-borne reptiles. When I say huge, I mean HUGE. This thing was far larger than the largest American alligators that I’ve seen back home. The Wikipedia article on the matter informs me that water crocs can reach 20ft in length and top the scales at 2,000lbs – it also provides some scary narrative about their feeding behavior. I believe every bit of it and I am sure glad that we weren’t kayaking the mangroves! We found some delicious food in Brunei. Much like Singapore, the local cuisine is a mix of Malay, Chinese and Indian foods. As we often do in our travels, we quickly found a convenient and favorite place to eat and we returned for a number of meals over the course of our three day visit. The roti canai cooked up at this place for breakfast was mighty tasty and we also had some excellent noodle dishes for dinner. Only in Brunei can one find a control tower with gold all over it! BSB’s airport is one of only two on Borneo that is served by Star Alliance airline (on their own metal, at least) and available for award redemption. Since flying out of Kota Kinabalu would have involved backtracking to Seoul, we booked two business class seats on Singapore Airline’s twice-weekly widebody service from Brunei. Brunei’s international airports departure lounge has vaulted ceilings and some small koi ponds scattered about that gave it a slightly Changi Airport (SIN) feel. After thoroughly exploring the curbside section of the airport, including the very nice rooftop “waving gallery” that has tarmac views, we headed through passport control to get showers in Royal Brunei’s Sky Lounge and have a few snacks. The flight to Singapore was a short 2-hour hop and we had a good view of the Sultan’s palace shortly after takeoff. This is what happens when you go from an aircon building into the humid outdoors in BSB. Pizza Hut, even in Brunei! There is a great observation deck on top of BSB airport. Coi at Brunei’s Airport – it’s like a minature Changi airport! On April 23 we finally squeezed the last segment out of our LAN award ticket that carried us all over Chile. 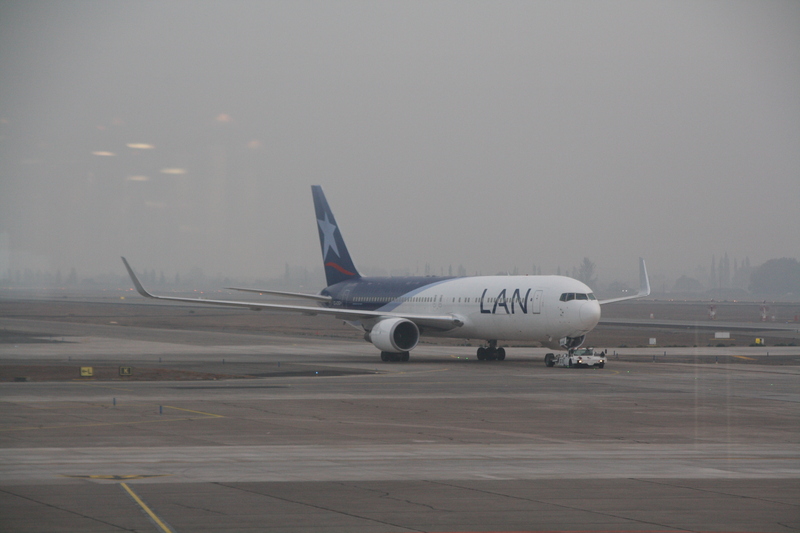 The final flight was from Santiago to Antofagasta in the north. It was a pleasant early morning flight on a cute little Airbus A318 (first time on that aircraft for me). Service was the usual drink and snackbox affair and arrival into Antofagasta was a little ahead of schedule. We bought tickets for a shared taxivan to the center and were dropped off at Antofagasta’s bus terminal a short while later. We had tickets to take us from Antofagasta to San Pedro de Atacama high in the Chilean Altiplano. The drive took us across some spectacularly desolate landscape. San Pedro de Atacama is a nice little desert town that thrives off tourism. We stayed at Hostal Sonchek, run by a Slovenia/Chilean couple. Like most of the buildings in San Pedro, our hostal was built of adobe and had a great open air courtyard in the middle. We stayed a total of five nights and saw some amazing things out in the desert. Stay tuned!